It’s Sunday. That means its time to look at the week in recruiting for the ACC. Big list today, a lot of moving and shaking. There were a couple commitments that will impact the upcoming the season and there is some interesting things happening with Landers Nolley’s August Bracket Madness. RJ Barrett released his top 5 and it’s full of the usual suspects. Arizona, Duke, Michigan, Oregon and UK. With the reclassification of Bagley, Barrett is easily the #1 player in the 2018 class. Duke is the front-runner here but keep an eye on Arizona. Nassir Little has scheduled another official visit. Miami will host on 9/15-9/16. Jimmy Nichols: The Conway S.C. 6’8 swingman has trimmed his list to 3, including Miami. Providence and South Carolina round out the finalists. Nichols is a long lean swing that recently took an unofficial to USCe. Pitt had also offered but Nichols must have not wanted to waste a year transferring away from Kevin Stallings later on. Armando Bacot: The 6’10 post from Richmond is the number one prospect out of VA and #24 nationally, tweets that a decision is coming soon. Included in the tweet that said “all offers” was GT, Wake, UVA, NCST, Louisville, UNC, Miami and FSU. Bacot is considered a UNC lean/lock. UNC off guard Kenny Williams, also a Richmond native has been openly recruiting Bacot on twitter. David Duke: The Cushing Academy CG released his top 5 and included Virginia Tech along with Providence, Florida, Indiana and Villanova. A top 50 player, Duke is right in Ed Cooleys backyard, it would be a surprise to see him get off the hook given Cooleys offensive focus. 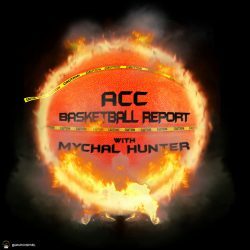 James Akinjo: UVA offered on 8/1 but the 3 star PG has recently named four teams that will get visits and UVA is not one of them. Indiana, Iowa St, UConn and Cal. Robert Phinisee did just commit to Indiana on 8/18 so that may have an impact on this situation. Quincy Ademokoya: visited Georgia Tech on 8/17. The 2020 forward recently transferred to Dacula in Georgia. Simi Shittu: Cut his list to 10 including UNC. Vandy, ASU, UConn, UNM, UK, USCe, Zona and Oregon join the Tar Heels. The 5 star PF from Vermont is the #9 player in the class. Aaron Nesmith: released his final 7. Virginia Tech is still in it for the 3 star wing from South Carolina. Nesmith has an official visit scheduled to Florida next week. George Conditt was offered by VT on 8/16 and also cut his list to 11 which includes VT as well as Georgia Tech. UNM, Iowa St, Maryland, UTEP, Houston, Washington, Illinois, Colorado and Michigan round out the list. Conditt is a 6’10 PF out of Chicago ranked just outside the top 200. Trey McGowans on campus at VT for an official visit on 8/16. 2020 PG Jalen Cone was offered by VT.
Michael Devoe has scheduled one of his OVs with Wake Forest. Nate Laszewski has been offered by ND, UNC and UVA. The power forward blew up over the summer and is going to be a good get for someone. Louisville Commit Anfernee Simons has moved up the latest rankings and is now a top 15 player as well as upgraded to a 5 star prospect. Top 5 2018 player Cam Reddish is expected to make a decision soon between Duke, UCLA, Nova UK and UConn. It should be noted that the 6’8 combo forward is very good friends with recent Duke Committ Tre Jones. They were roommates at the Nike Skills Academy. Pitt hosted a trio of future prospects in Brandon Stone (2018 3 star), Tre Mitchell (2020 SF) and Maceo Austin (2019 2 star) this weekend. PF Zion Griffin cut his list to 4 which includes Pitt. This would be a big get for Kevin Stallings. Jalen Lecque, a big time athletic point guard is being tracked by multiple ACC programs. Wake, Clemson, GT, Miami and Syracuse have all been said to have offered. Virginia Tech is said to be tracking 6’5 Hargrave swingman DJ Myers. Cannot confirm an offer. Jermaine Harris (4 star PF) has decided to set his 5 visits and will be in Coral Gables on 10/20. There were a couple of commitments to get in as well. Deontae Hawkins will be attending BC after all. The 6’7 impact grad transfer re-committed after decommitting from his original commitment. New Mexico JC big man Kenechukwu Chukwuka committed to Pitt on 8/8/17. Robert Phinisee has committed to Indiana. This is of interest because UVA was in his final 5. Recruiting Roundup would not be complete without a Landers Nolley update. Things took a bit of curious turn this week when it was released that Nolley would take an OV to VT, as well as UConn and Georgetown. Nothing about that is actually strange until you take into account his recruiting bracket. Currently there are 16 teams still alive for Mr. Nolleys services, and in his bracket, Georgetown and VT are a current matchup. This leads me to believe that someone (G-Town) is making up some serious ground. You may either see the bracket be adjusted, scrapped or no update on it until October. It is also said that Nolley will be on the NC State campus next weekend though it was not specified whether it is for an Official or Unofficial visit. Which leads me to believe it’s an unofficial.